British GQ yesterday named Tony Blair as the winner of their Philanthropist of the Year award. The award was part of GQ's Men of the Year 2014 Awards ceremony which was crammed full of celebrities in London last night. The general public were left in a state of disbelief after the announcement was made and took to social media to air their grievances. GQ gave a glowing tribute to the former Prime Minister citing his hard work in philanthropy on top of his demanding position as Middle East Peace Envoy. GQ name checked The Tony Blair Sports Foundation, Blair's Faith Foundation and the Tony Blair Africa Governance Initiative as shining lights of his philanthropic contributions. 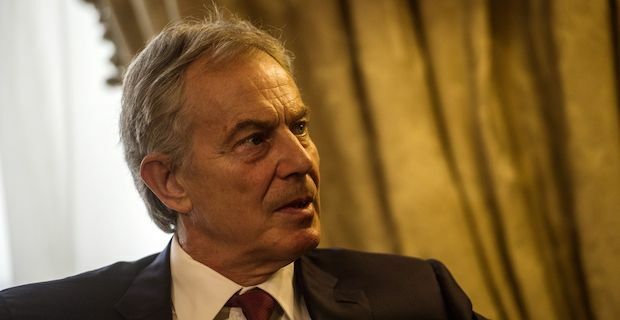 In spite of all that though, the reaction on social media to the announcement included a lot of criticism for Blair's role in the wars in Afghanistan and Iraq. One Twitter user, @toddlerlex, praised Blair with his tongue firmly in cheek saying "I hear other @BritishGQ nominees at the #GQAwards sadly couldn't make it because, unlike Tony Blair, they were in prison for their crimes." Gary Lineker also seemed bemused by the award and tweeted "Apparently, Tony Blair has won GQ's philanthropist of the year award. Finally these awards have grasped irony!" while @NickMotown tweeted "Nobody on Twitter is going to write a funnier joke than Tony Blair being named Philanthropist of the Year. Well played, real life." Other winners on the night included Benedict Cumberbatch for acting, Agi and Sam for Breakthrough Fashion Designers, Van Morrison in the Legend category, Ringo Starr for Humaitarian, John Bishop for Best Comedian and André Balazs for Entrepreneur of the year. The round up of all the awards are available on the GQ website or if you prefer the print edition will be released this Thursday.